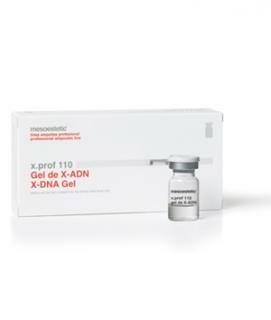 X-ADN has a restoring ability of cell proteins and connective tissue of the dermis damaged by sun exposure, oxidative stress or smoking, allowing for the recovery of collagen proteins. Its efficacy level is dependent on the size of the DNA chain used, since the high polymerisation leads the product to be more active and to improve tissue penetration. It has a synergistic action with vitamin E.
- It is particularly indicated in all facial aging treatments, when wrinkles are associated with dehydrated, dry, dull skin, with incipient ptosis. - It may also be used secondarily to fight cellulite, helping to reestablish microflow and rebuild connective tissue, in addition to neutralising free radicals.